TM CHINCHILLAS › P.32 ® FREEZE DRIED FOOD • KID'S COLOURING PAGE • AQUARIUMS FALL/WINTER 2015 + LARGE BREED DOG NEEDS Your Pet.Your Life.Your Store. Pet Valu Our BIGGEST Issue EVER! 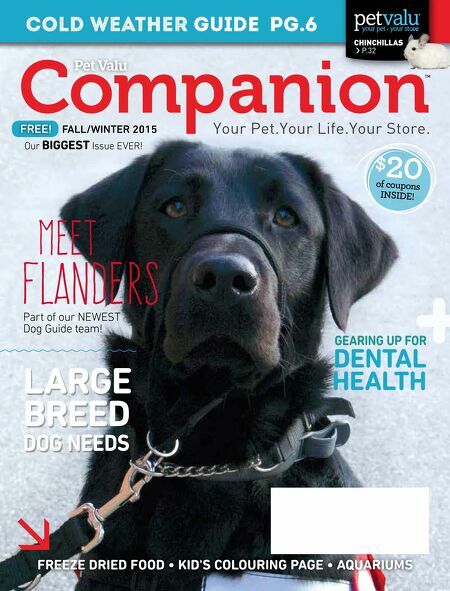 Meet FLANDERS Part of our NEWEST Dog Guide team! $ 20 of coupons INSIDE! GEARING UP FOR DENTAL HEALTH CHINCHILLAS COLD Weather Guide pg.6 FREE!